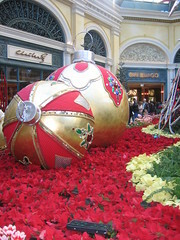 I was interested in the holiday decor they had up - some of it was very restrained (Caesar's) and some, not so much (the Bellagio, above). Also, I had the list of hotel prices that I was working from when I made my reservations (some of these came from hotel websites and some came from Travelocity or Orbitz, as I recall). I got mono without kissing anybody, or even knowing anybody who was diagnosed (bizarrely, two of my internet acquaintances got it around the same time, but I'm pretty sure it can't be transmitted via TCP packets). I was in college at the time, and the best theory my doctor had was that I got it from sharing keyboards at the computer lab where I worked. It seemed mostly like an ordinary cold, but with massive, intense, lingering tiredness. I wasn't extremely sick, but I was falling asleep every night by 8:30 or 9pm, no matter what. The exhaustion would just hit me by mid-evening, really abruptly, and I had no choice but to go to bed. I had a mild case, though, so mild that the doctor told me he was sure I really didn't have it. He actually kept asking me leading questions about depression, because I kept complaining about how lethargic I was and how disruptive it was becoming, and he just ran the mono test to cover all his bases. (I was like, "Um, I actually know when I'm depressed.") He was a bit sheepish when the test came back positive. Of course, the treatment for mono? Sleep when you feel like sleeping, and don't expect it to go away quickly. I hope you don't have it! I had a KILLER case of mono that lasted for a year, but that's kind of the worse case scenario. For most people, it's more like a really annoying cold. And yeah, I got it without kissing anybody.